What you can do to keep your mood up while your body is down. I was running in the park one night this past spring when I felt a twinge in the heel of my right foot. I should have rested the next few days, but I kept walking and running, because I was scared to find out what might happen if I didn’t. I’ve sparred with depression and anxiety issues for literally as far back as I can remember (though these diagnoses would not be attached to my sad and agitated feelings until I was 23), and it’s no secret that exercise can be a hugely important component to staying mentally healthy and happy. According to the National Institutes of Health, exercise improves mental health by reducing anxiety, depression and negative mood, and by improving self-esteem and cognitive function. I had spent most of my 20s, however, giving into my moods and eschewing exercise, along with pretty much anything else I could have been using to help my mental health, except for pills, which I hoped would serve as a panacea. But a few months short of 30 it got just bad enough for me to start actually taking care of myself. Once exercise was part of my daily routine for the first time since college, I noticed positive, borderline extreme improvements. I was going for runs and taking long walks using an elliptical. My negative thoughts rapid-firing was draining even though my main objective was to rest. The heel kept getting worse. On Memorial Day I found out there was a micro-tear in my Achilles tendon that was infected. I was put on a strong antibiotic and bed rest for two weeks. It was awful. Spending a week in bed, away from my job — the only thing that makes me more anxious than work is missing work — with my negative thoughts rapid-firing was draining even though my main objective was to rest. I was able to get back into my routine within a month, though, and in doing so, got my mood back under some semblance of control. Then, in August, due to favoring the left side of my body too much, I broke a bone in the ball of my left foot called a sesamoid. I was very scared this time, because I’d gotten a taste of what it was like to be non-ambulatory for one week, and was going to have to spend at least six in a walking cast. I could commute only to and from work, and it would be months before I could return to regular physical activity. But I’m (hopefully) almost healed, and feeling decent; actually, better than I have in years, because while this summer has been physically and mentally painful, I’ve worked to find new ways to cope in both respects. Here are a few things that I have learned that have helped me maintain my mental health while dealing with physical injuries. Productivity of pretty much any sort has always helped me stave off depression and anxiety. So when I found myself in pain and unable to leave my apartment or complete normal, everyday tasks, I immediately became agitated. I didn’t know what to do with myself, and as a chronic over-thinker my initial tendency was to lie in bed or on the couch, mentally beating myself up and letting my mind run rampant with thoughts that were mostly negative and unwarranted. For advice, I reached out to my friend Paul Shirley, a writer and former professional basketball player who has suffered through more broken bones, infections, surgeries, concussions and other physical maladies than I can list here. Those came with the mental downfall. He encouraged me to stay mindful of the fact that while it might not feel like it and seems initially counterintuitive, letting yourself rest is not time wasted. While it might not feel like it and seems initially counter intuitive, letting yourself rest is not time wasted. “I’ve not always been very good at this, because I feel very guilty when I’m not being productive, but when I’ve been at my recovery best, it was when I came to terms with the fact that healing is its own productivity — that I was ‘doing’ something by resting or keeping myself entertained,” Shirley says. I started to embrace the power of rest, and before long was actually having a pretty great time reading and binge-watching shows and films I’d been meaning to check out. (I am still working my way through Game of Thrones, though.) I accepted that it was okay to let my body heal, and that gaining something from a book or show, even if it was just a few minutes of laughter, was something worth feeling good about. No matter the nature or expected duration of your injury, there are still things you can do that can help you feel productive, active and keep you mostly in a positive headspace. One thing I was worried about during my injuries was gaining back weight I had lost when I had started to exercise — an improvement in health that in and of itself had helped improve my mood and self-confidence. Since I couldn’t burn as many calories through movement as I had become accustomed to, I made sure to eat healthier and drink less while still getting the vitamins and nutrients I needed to heal a fractured bone. Eventually, I stopped feeling sorry for myself about not being able to run or glide on the elliptical, and looked for other ways I could stay in some modicum of shape until I was back in fighting form. So I bought a Shake Weight (seriously) and found a workout video made specifically for people in a walking boot from fitness expert Caroline Jordan, who just so happened to make the video when she was recovering from the same broken bone as I was. I’d known for quite some time that meditation can be very beneficial for mental health and healing, but it wasn’t until I hit a low point during my bed rest that I finally got into it. I assumed that if I were supposed to sit still and concentrate on my breath, my thoughts would become more amplified than they already were, which would yield the opposite of the effect I was looking for. Meditation definitely takes practice, but if you’re down and out with an injury, you probably have plenty of time to practice. It has helped me a lot. I do it now every single morning, mostly without fail, and if for some reason I skip it I notice that I feel off-center and more anxious than I do when I practice in the morning before heading to work. Meditation definitely takes practice, but if you’re down and out with an injury, you probably have plenty of time to practice. If you’ve never meditated before or are fairly new to the practice, you might want to check out one of the many smartphone apps that will help you learn. Headspace is a very popular one I started with and still use. I also like Pacifica, which has the meditation component along with some cognitive behavioral therapy tools and other features that have helped me cope with stress, anxiety and depression. As with meditation, I knew journaling would be a beneficial practice for my depression and anxiety, but I didn’t do it diligently until I was hurt. Now I write in my journal almost continuously throughout the day, when I’m either happy or upset about something, or if something else significant happens. You may like to write with pen and paper, but I use Day One Journal, which works across multiple devices. When it comes to writing out my thoughts, I like to type on my laptop or phone, because I type faster than I write longhand, and my journal is essentially stream-of-consciousness. I began therapy this summer, when I was nearly recovered from my first injury but remained worried and frightened about how mentally unstable I’d felt during my time of mandated bed rest. It’s been only a few months, but it has changed my life — something I don’t say lightly. I’ve become that person who will advocate therapy until I’m blue in the face. Therapists are great not only for hearing you out (if you don’t feel like journaling everything), but many are also great at giving you some positive direction that, if you’re willing to work at it, will help you improve between sessions. I’ve become that person who will advocate therapy until I’m blue in the face. “Speaking to a therapist during [the time of your injury] could be immensely beneficial in warding off or addressing anxiety and depression symptoms,” Behrami says. Shirley, who manages back pain that is a residual effect of several of his basketball-related injuries, says his trips to see his therapist stand out above dry-needling (similar to acupuncture), physical therapy and Pilates as perhaps “the most important’ facet of his treatment efforts. If you can’t leave your home, there are many options now for seeing a therapist without actually stepping into their brick and mortar office. Many therapists offer remote appointments where you can have a session by phone or over video chat. There are also app-based therapy services like BetterHelp that will match you with a therapist you will “see” in an exclusively virtual capacity. If your first therapist isn’t the perfect fit, try not to be discouraged. It may take a few before you find one who really helps you in the way you’re looking for, and who you’re truly comfortable talking to about literally anything. When I first got hurt I just assumed that my life was going to essentially be me, myself and Netflix until I was again fully functional (which sometimes didn’t seem like all that horrible of a prospect, to be honest). But it doesn’t have to be that way. If you really stop and think about it, I bet you’re like me in that a great deal of your communication with friends and family comes digitally. 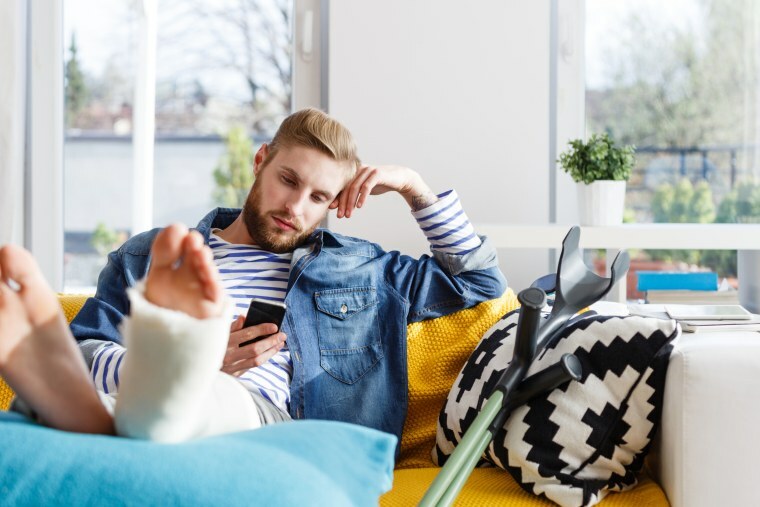 I exchanged texts and phone calls with family and friends throughout my injuries, and found that they were always there for me even if they weren’t physically there. Many who live near me were quick to offer to come over and watch a movie and eat takeout or play some video games (which I should mention are another activity to engage in while injured that will help distract you from depressing thoughts). You will get better. Even if the injury itself has chronic tendencies, you will find ways to improve and regain your physical health. And no matter how sad, depressed, anxious or agitated you feel, always remember that you will get better. It may take some work, and it may take some time, but it will be worth doing whatever it takes.